I don’t know about you but I have this terribly annoying habit of storing information in my mind of things I simply must own one day. Even though it may have been years since I came close to buying or dreaming of them, it doesn’t stop me wanting them all the more. Truth is this is my way of making a wish list, hoping that one day I stumble upon them by chance. Like the lovely Ella’s Thrift Lists, I see this as my definitive list of my most sought after items. eBay on occasion has come to the rescue, but to be honest I could probably scour the Internet for days and find my most desired, if money was no object of course. But the pure thrill of hunting, waiting (in some cases years) makes for the biggest gain when one day they may just come into my life unexpected. I have wanted to invest in a good quality Roberts Radio for a while now, and know one day I will do just that, and of course deciding on what colour may be a challenge in itself. This one came about in my late teens when I really got into fashion through my studies, the retro appeal and hippy nature of them hugely appealed to me, the chance to capture a piece of that 60s magic sure was ever desirable. The fact they come in their own electric yellow tin, completely seals it for me. I have always had a bit of a fancy for one of these, I’ve come close to buying one in the past, but sadly they have always been damaged or broken. The kitsch factor alone has my heart racing and my love of all things cute makes this one all the more desirable. This quite simply is the case of the one that got away, because when I was younger I stumbled upon a pair of these in a charity shop, but I was literally moments too late, as a lady had already got them in her hand when I entered the shop. From that day on I have lived with that dreadful memory and can only learn from my mistake. I’ve flirted with fragrance since I was bought my first perfume aged thirteen (Anna Sui of course) and am forever on the quest to find my signature scent, but if there was ever a scent I long to wear it has to be Chanel no 5. But I’m kind of glad I haven’t ever stumbled upon this one before, for it would suit a much older me. I've always wanted some No.5 but I opted for Chanel by Channel instead, it's a bit more lighter and fruity for me. I've always wanted an old style telephone, the one you have to pick up the ear piece separate, wouldn't mind if it never worked. Just so pretty! Great post Alice, I've been meaning to put my mental wish list down in black and white for ages. If I get an idea in my head for making something I try and track down the relevant thing asap, but there are loads of things where I hope the universe will do its work! Loving this post, I have to agree on the florals DMs and the Babycham deer! Both things I would be pretty ecstatic to own :-) My Roberts radio was a Christmas present, I hadn't been expecting it and you can imagine how well it went down, the problem is that now I have the Duck-Egg colour I'd like the Saffron yellow too! Chanel No.5 is actually something I've never tested the fragrance of believe it or not, I really should have a sniff the next time I get near a tester! Ooo oooo oooooo! I wouldn't a little vintage looking radio, I'd have to pick red if I ever got one just to add to the retro aspect! I've watched a few Babycham Deers on eBay in the past but they always go for way more than I'm willing to pay! floral DMs, ooh yes please. My nan used to wear Chanel no.5 and that has quite spoilt it for me. I've wanted one of those radios for absolutely ages! I love the Mary Quant crayons, too. That's a nice and colourful lot! I'm with you on Chanel No 5. It's the one I wear every day! 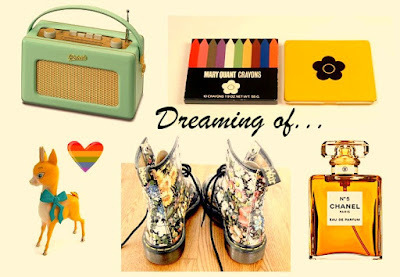 Those Doc Martens are gorgeous - can certainly see whay they're on the list! I have been lusting after a Roberts radio for so long! Yes, yes and thrice yes. I'm checking off several of my own personal wishes here including the Roberts radio. I would have fallen upon those Doc Martens too. Who gives away such things? Comfort yourself with the thought that they probably weren't in your size anyway. I feel your pain though. On more than one occasion I've stumbled upon someone in the process of buying something I really want and have had to stop myself pointedly staring with longing (and freaking them out). I wish I could wear Chanel no5 but find that Chanel Mademoiselle is much better for me!